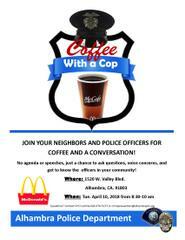 Please join us for coffee and a conversation next TUESDAY (April 10th), from 8:30-10 a.m. at McDonald's on Valley BL. This will be a great opportunity to get to know the officers in your community and gives you a chance to ask questions and voice concerns you may have in a friendly atmosphere. Our goal is to build relationships with our residents and businesses in our community. We look forward to seeing you there!